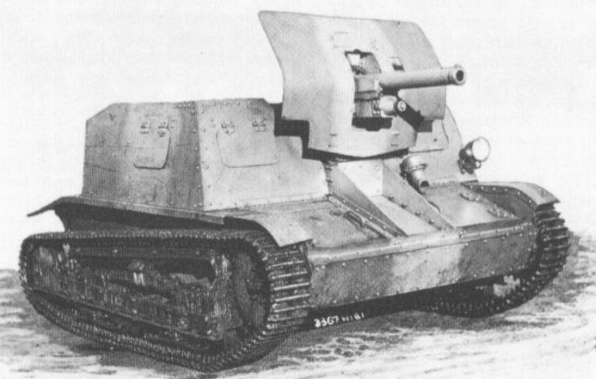 The TK3 was a two-man Polish domestic-built tankette, heavily inspired by the British Carden-Loyd Mark VI. Some 300 vehicles were built, which made the TK3 one of the most numerous armored vehicles in Polish service before the Second World War. The TK3 was characterized by its small size and good speed and it was also cheap and easy to manufacture. On the other hand, the TK3 suffered from limited visibility (when all hatches were closed during combat operations), insufficient firepower (only one machine-gun), two-man crew and poor armor. To solve some of these problems, a new lightweight support version named TKD, armed with a new experimental 47mm infantry support gun, was developed. Limited numbers were converted for the Polish army in 1932. Four of the first series of TK3 production vehicles, constructed from mild steel (registration number 1156-1159), were used for this purpose. The Polish military officials planned that, if the TKD project proved to be successful, some cavalry brigades would be equipped with the TKD in order to use it as a mobile fire support and anti-armor vehicle. For this project, it was necessary to find an adequate gun to be mounted on the TK3 chassis. Because there were no suitable guns available to be used, it was decided by J. Lapuszweski (the project leader) to mount the experimental 47 mm wz. 25 ‘Pocisk’ infantry support gun. Ironically, this would be the only use of this new gun in operational service. Some sources claim that the French 37 mm SA.18 and Vickers 47 mm were tested on one TKD. It is hard to say whether this is true or not, as there are no photographs or original documents of these possible modifications. While installing the new gun, several changes had to be made to the vehicle itself. The upper hull and the roof armor were removed to make room for the new gun. The TKD had a open combat compartment, which allowed the crew an excellent visibility of their surroundings. In combat situations, the crew could also use four observation hatches (two in the front and one on each side) without exposing themselves to enemy fire. The gun, with its flat lightly armored shield, was positioned in the center of the frontal part of the vehicle. The gun had an elevation of -12° to +23° with limited traverse. Total ammunition carried inside the vehicle consisted of some 55 rounds. Because of the small size, there was room for just two crew members, the driver and the commander/gun operator. The commander was positioned on the right and the driver on the left side of the vehicle. One advantage the small size and open-top nature of the vehicle was the ease with which the crew could enter and leave their positions. As previously noted, the vehicles were built using mild steel (only the gun shield was armor plated). When we add the fact that it was open top, crew protection was at a very low level. The TKD’s best defense was its small size, a good camouflage and a well-chosen combat position in action. Because of these changes, the total weight of this vehicle reached up to 3 tonnes. Some modifications had to be done to the suspension. It was strengthened and new wider tracks were used. The dimensions were similar to those of the original TK3 except perhaps the height (if we exclude the shield) and were: length 2.58 m, width 1.8 m and height of around 1.2 m.
In addition to all these changes, the rest of the TKD was same as the original TK3 tankette. The engine was the same 40 hp (4-cylinder). However, due to the increased weight, it probably had worse mobility specifications than the TK3’s 46 km/h top speed and 200 km/ 110 km (cross country) operational range. Although the TKD meet nearly all the tactical requirements, only four were built. The poor gun penetration and the fact that the 47 mm gun was not accepted by the Polish army for operational field use did not help either. A magazine for military vehicle enthusiasts, Volume 5, Number 12. Although the TKD project was abandoned, the already built vehicles were given to the Polish army and were used for some time. Their first operational field use was during the 1932/33 army maneuvers. There, they formed a special experimental platoon assigned, as originally planned, as an anti-tank reserve in one cavalry brigade. The results of these maneuvers showed the good characteristics of these vehicles, but they also pointed out the problems with the construction itself and the poor armor penetration of the new gun. For some time after that, they were used for training in the training center in Modlin near the capital Warsaw. All four TKDs (according to some sources only two), along with two TKS-D prototypes, were attached to the 10th Cavalry Brigade. This unit participated in the annexation of Czechoslovakian territories which had a considerable Polish population in 1938, in cooperation with Germany and Hungary. Their later use was not precisely documented, but there is a chance that they were used during the German invasion in 1939. According to some old photographs, they may have been used (without the gun) as ammunition carriers or another transport role. Some sources claim that they were used in the defense of the Polish capital, Warsaw, and lost there. The 47mm wz.25 was a semi-automatic Polish infantry gun designed in 1925 and nicknamed ‘Bullet’ (Pocisk-Polish.). This gun had a high rate of fire, reaching some 16 rounds per minutes. It was relatively light, weighing only 240 kg, which was an advantage since it was designed for infantry support use. The gun elevation was -8° to + 43° with a traverse of 40°. It was equipped with a gun shield. HE – Muzzle velocity of around 365 m/s and a range of 6500m. 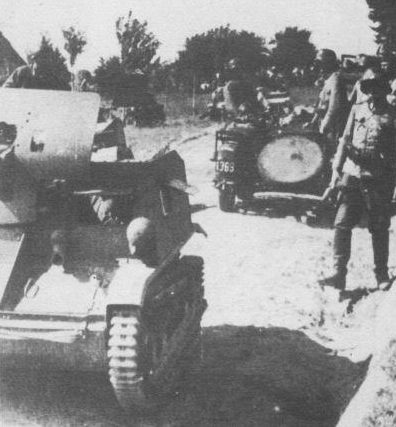 Even though it was a relatively good and modern design, the Polish army decided to abandon the 47 mm wz.25 project, mostly because of the insufficient armor penetration. Only a few were built, although the exact number is unknown. However, since these four TKD vehicles were equipped with it, at least four were made. Was armed and tested with the Short-barrel 47 mm Vickers QF infantry gun.